How much freedom does, or should, an individual give up for a country’s collective welfare? Social democracy—adopted by the Nordic countries after World War II—borrows from socialism, democracy, and the labor movement to balance economic growth with public welfare. The result has brought an enviable living standard with first-class health care and public education. Yet even in such societies, artists become anxious. 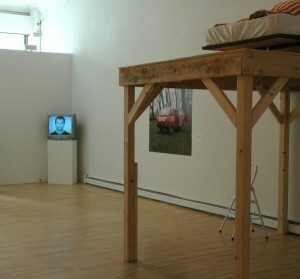 Social Democracy Revisited, at Apexart, was organized by Jonas Ekeberg, director of Preus Museum in Horten, Norway, and presents the work of seven Scandinavians who use photography, video, performance, posters, and self-published newspapers to comment on the tensions between egalitarian culture and individual identity. 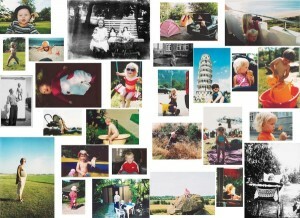 The populist-minded Swedish American artist Aleksandra Mir celebrates collective identity in Danes in the Sun (2004), a thirty-two-page newspaper with interviews of people from the town of Ikast that were published alongside local travel snapshots, sports photos, family portraits, and such. They mostly depict leisure activity, creating a playful if suspiciously comfortable-looking scrapbook of life in the town that verges, intentionally or not, on propaganda for the system. For Untitled (Class Structure) (2000–1), Jakob Kolding casts a more critical eye on the exhibition’s subject, examining the rational process of planning a Danish community. 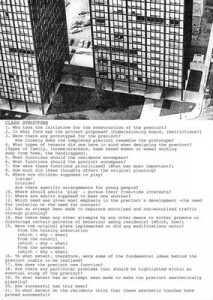 Kolding has reproduced lists of questions from actual government documents given to architects and builders and placed them underneath deadpan images of suburban homes, low-rise housing projects, and monolithic modernist towers. In addition to addressing practical matters such as the placement of pedestrian pathways and access to playgrounds, the questions seem to examine the appropriate divisions of public life and private needs. Kolding’s critique of social democracy—that an overbearing bureaucracy dehumanizes the very people it aims to help—is the strongest in the exhibition. Public education is seen as a success of social democracy. 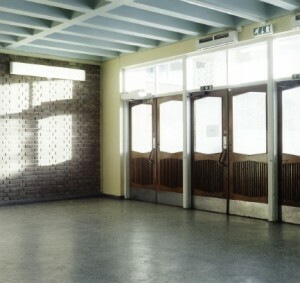 In Marienlyst Public School (2000), Katja Høst aims her camera on empty school spaces beautifully illuminated by natural light. Neither nostalgic nor analytic, her photographs invite contemplation on the social spaces of the education system. Ulf Lundin turns inward. 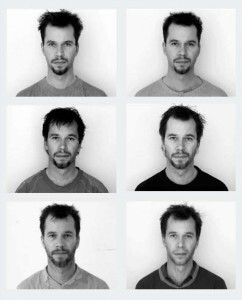 In an ongoing project begun in 1999, he records his face on video and uses morphing technology to create a self-portrait that shows him slowly and rhythmically aging. In the context of this show, the work seems to speak to the idea of self as heroic existentialist, negating the collective state. Social Democracy Revisited, which also includes a photograph by Cathrine Evelid and a video installation by Matias Faldbakken, succeeds in exploring abstract, philosophical ideas of life in social democracies. 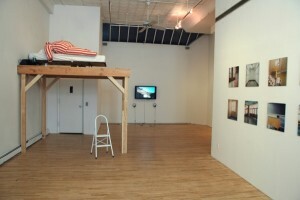 But the work mostly avoids important and controversial political realities, such as the assimilation of a growing immigrant population into a largely homogeneous society. That kind of contemporary relevance would have further elevated the show. 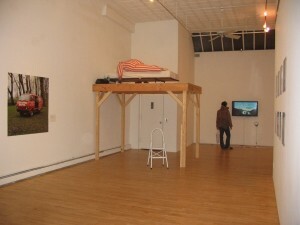 Originally published as “Art Tackles Tensions in Nordic Society” in the Tribeca Trib in April 2005.